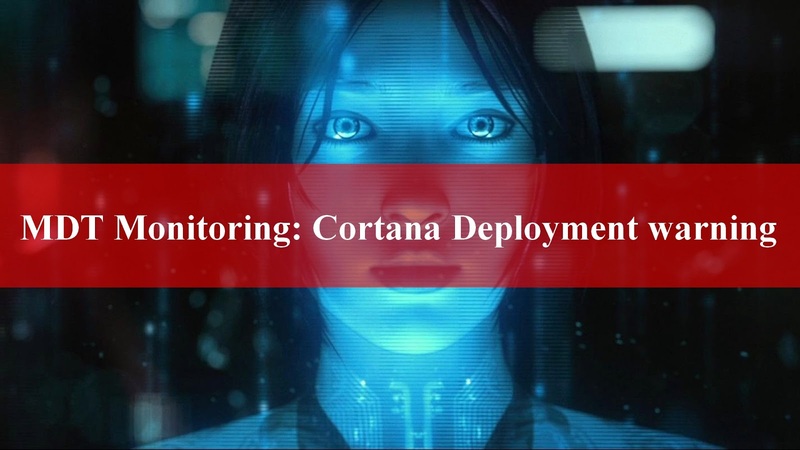 In this post, I will show you a way to monitor your deployment from a Windows 10 client computer and use Cortana to warn user when a deployment is completed successfully or when an error occurs during the deployment. This post is the fourth one, about MDT monitoring. In the first I used the BurntToast module to display notification about your deployment. In the second I used a WPF GUI to display deployment success or error warning. In the third, user receive a mail when deployment is successfully installed or in case of error. How to get the scripts ? It can be used on any Windows 10 computer. No need to run it on the MDT server, you can run it on a client computer. 3 / Once you have typed the computer name, let the script works. Don't close the PowerShell window, the script will analyze your deployment. First you will need to complete the Monitoring_infos.xml file. Type your Deployment Share and MDT module paths. The MDT module path should be the path to the MicrosoftDeploymentToolkit.psd1 file. By default, it's located in C:\Program files\Microsoft Deployment Toolkit\Bin. See below, an example of this file. Then you will need to complete the Monitoring_messages.xml file. This file contains message that Cortana will used to speak and warn user in case of success or error. By default messages are in English. You can of course type your own message. See below this xml file. See below, the main Monitoring.ps1 file used to monitor your deployment.